First there was #thighgap…now we have the #bellybuttonchallenge to look forward to. Over the past few weeks, I’ve seen the “belly button challenge” all over social media. Apparently, it began in China, but has exploded online. So…what is the belly button challenge you ask? Reach behind your back and around your waist and see if your hand can cover/touch your belly button. For the sake of this blog post, go ahead and try. Can’t do it? Well, then you are considered “too heavy” according to Chinese social media. But really, it could also mean that your arms are really muscular-right? When you come down to it… it’s actually a test of shoulder flexibility, and not fitness. (I learned that the shoulder has the greatest range of motion of any joint in the body.) The belly button challenge has become a way for teens, mostly girls – to seek approval online with their body while shaming others. It also says a lot about China’s obsession (really everyone’s obsession) with being thin. Teens are snapping #selfies of them-self while doing the challenge and posting them online. A successful belly button challenge attempt is met with praise, “likes” and affirmations that YOU are thin enough. If deemed thin enough, then you are accepted by the online “belly button” police. And if you can’t do the challenge, there is a double standard. For a boy posting a photo of himself failing the challenge, he still receives “likes.” Many of those photos will show the boy desperately struggling to reach his belly button while making funny faces, contorting his body and laughing. However, for girls posting their failed attempts online for all the world to see, isn’t met with praise or “likes.” She is telling the world that she is unhealthy…. unworthy, and shameful. This can do a number on anyones body image and self-esteem. So if you are a teen, don’t fall for this challenge or take it too seriously. Remember, it has nothing to do with health. It’s just another silly social media game to laugh about… and nothing more. 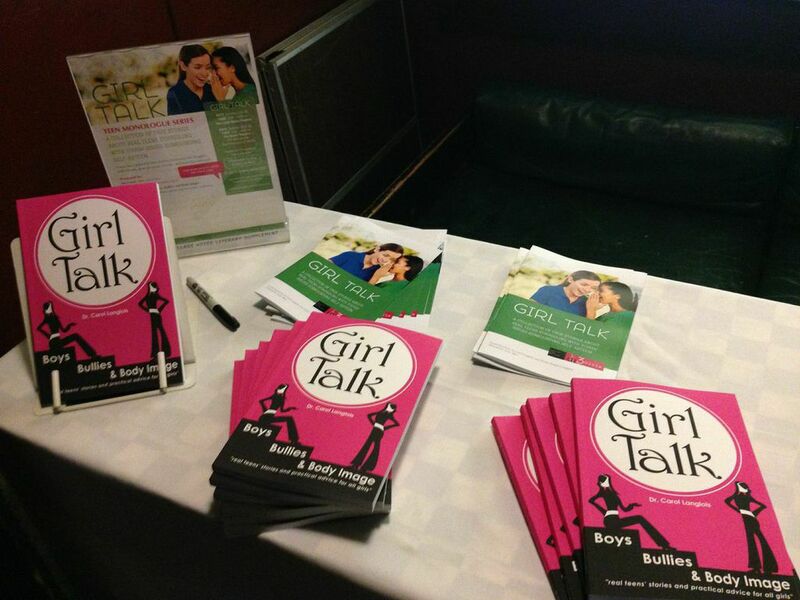 Girl Talk: Interview with Author Dr. Carol Langlois About her new Book for Teen Girls. We’ve loved Dr. Carol Langlois’s advice for Your Teen readers over the years, so we were excited to hear about her new book, Girl Talk: Boys, Bullies & Body Image. We caught up with Dr. Carol to find out more. Tell us about the approach you took with this book? In total, I interviewed (and taped) about 160 girls from 10 schools in the Bay Area. After sharing my taped interviews with a few other writers and editors, they suggested that sharing (their stories) from a first person perspective would be very powerful. In the end, I chose 10 stories of ten girls who’s challenges with self-esteem were relatable and transcended culture, race, and socio-economics. What’s going well for girls these days? I would say that their access to and utilization of information is abundant. They can educate themselves on so many topics more easily today. If they want to learn about puberty, smoking, pregnancy, healthy eating, etc.—they can. They know the risks and the pro and cons of most things to make better informed decisions. Many teens today have strong opinions about drugs and alcohol, the environment, or global warming for example because of information from the web. This is incredibly beneficial in helping them make smart choices. For the book, I interviewed quite a few girls who were dealing with or had survived through some form of an eating disorder, which I think is worth noting. More abundantly were issues of perfection and anxiety—not necessarily unrelated to eating disorders. Stop the critical self-talk. Instead, model positive self-acceptance around girls. Teens are stressed out more than ever. I call this the “duck syndrome.” Think about the duck who looks very serene, calm, and pleasant floating along a lake. Then, if you look under the water she is paddling frantically. That is the duck syndrome. Too many students on the outside appear calm, cool, and collected while on the inside they are completely stressed out. Its a “fake it ’til you make it” mentality. For many, they want to be the great student, the great athlete, and well-liked by peers. But what price do they pay? Proving you can do it all has transformed into an ugly state of unattainable expectations and extremes, which are unhealthy for teens at any age. I’ve seen this further progress into eating disorders for the perfect body and drug addictions to manage the high pace and stress. This is a recipe for disaster. – See more of this interview here.